Right after the election, I biked, blogged, and smoked a lot of grass. When I began coughing, I cut out the marijuana. I then joined Jen Hoffman’s Americans of Conscience Action Committee, which sends weekly emails with suggestions of what to do, from demonstrations to phone calls to letters and petitions; I’m still part of that effort. The event which helped me the most was the Women’s March the day after inauguration. I couldn’t go to Washington because I was unable find a place to stay for under $500, so I marched in NYC. 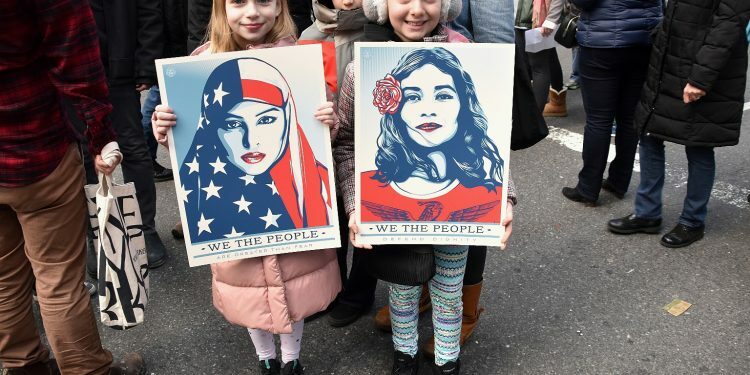 I carried the Shepard Fairey poster of a Muslim woman wearing an American flag hijab. 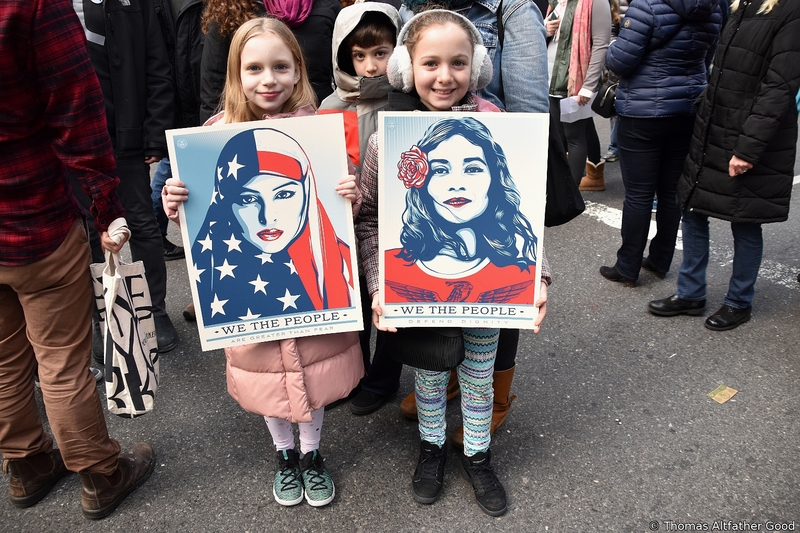 Not only were the crowds and other signs inspiring, a number of Muslim women came up to me to thank me for carrying the poster. I also marched on International Women’s Day and Tax Day. I also posted one on how I believed it was easier for older women like myself (I’m 74) to bear this defeat, since we had lived through Nixon’s presidency, the Vietnam War, etc. This sentiment was born out by a wonderful anthology I was asked to blurb at this time. Called We The Resilient: Wisdom from American Women Born Before Suffrage, it was edited by Sarah Bunin Benor. She had first interviewed a very diverse group of women a generation older than me before the election and then again afterwards. They all spoke about carrying on, keeping your ideals despite adversity, and working for a better future. I was also fortunate to live within the “Brooklyn bubble” and to have only one family member who voted for Trump. All this helped keep me grounded and centered. Bonnie Anderson pioneered women’s history and is a professor emerita from the City University of New York.